02:37 — Doctor Who: River Song coming to Big Finish. 04:51 — Neil Gaiman: American Gods TV series. 06:33 — Doctor Who: The Underwater Menace DVD cancelled. 08:21 — Patrick Macnee: DEAD! 11:11 — Clangers: want your money for toys. 13:16 — Colin Baker: wants your money for crowdfunded short film. 16:05 – Doctor Who: Pyramids of Mars. 32:54 – Minions (2015 film). 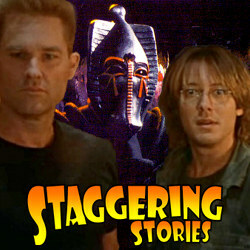 35:42 – Stargate (1994 film). 69:59 – Farewell for this podcast! 70:52 — End theme, disclaimer, copyright, etc. Big Finish: The New Series. Indiegogo: Colin Baker’s Last Man on Earth.